This proclamation supersedes proclamation M-14-2017 dated September 21, 2017. This proclamation opens Management Unit D1 to the use of gill nets with a stretched mesh length of 4 inches through 6 ½ inches in accordance with the Sea Turtle ITP. Management Unit B: Subunits ONLY below within the Internal Coastal Waters, bounded on the north by 35° 46.3000’ N latitude which runs approximately from the north end of Pea Island (old Coast Guard station) westerly to a point on the shore at Point Peter Canal, on the south by 34°48.2700’N latitude which runs approximately from the Club House on Core Banks westerly to a point on the shore at Davis near Marker “1”, and on the west by 76° 30.0000’W longitude. The area from Wainwright Island to Ocracoke Inlet bound by the following points: Beginning at a point on Core Banks at 34° 58.7963’N - 76° 10.0013’W, running northwesterly near Marker # 2CS at the mouth of Wainwright Channel at 35° 00.2780’N - 76° 12.1682’W, then running northeasterly near Marker “HL” at 35°01.5665’N - 76° 11.4277’W, then running northeasterly near Marker #1 at 35° 09.7058’N - 76° 04.7528’W, then running southeasterly to a point at Beacon Island at 35° 05.9352’N - 76° 02.7408’W, then running south to a point on the northeast corner of Portsmouth Island at 35° 03.7014’N - 76° 02.2595’W, then running southwesterly along the shore of Core Banks to the point of beginning. The area from Ocracoke Inlet to Hatteras Inlet bound by the following points: Beginning at a point near Marker #7 at the mouth of Silver Lake at 35° 06.9091’ N - 75° 59.3882’ W, running north to a point at 35° 08.7925’ N - 76° 00.3627’ W near Big Foot Slough Entrance, then running easterly to a point at 35° 09.4994’ N - 75° 54.2943’ W, then running northeasterly to a point at 35° 11.9803’N - 75° 51.6396’ W, then running easterly to a point at 35° 13.4489’ N - 75° 47.5534’ W, then running southerly to just northwest of the Ocracoke/Hatteras Ferry terminal on the Ocracoke side at 35° 11.5985’ N - 75° 47.0768’ W, then southwesterly along the shore to the point of beginning. The area from Hatteras to Avon Channel bound by the following points: Beginning at a point near Marker “HR” at 35° 13.3152 ’N - 75° 41.6694’ W, running northwest near Marker “42 RC” at Hatteras Channel at 35° 16.7617’ N - 75° 44.2341’ W, then running easterly to a point off Marker #2 at Cape Channel at 35° 19.0380’ N - 75° 36.2993’ W, then running northeasterly near Marker #1 at the Avon Channel Entrance at 35° 22.8212’ N - 75° 33.5984’ W, then running southeasterly near Marker #6 on Avon Channel at 35° 20.8224’ N - 75° 31.5708’ W, then running easterly near Marker #8 at 35° 20.9412’ N - 75° 30.9058’ W, then running to a point on shore at 35° 20.9562’ N - 75° 30.8472’ W, then following the shoreline in a southerly and westerly direction to the point of beginning. The area from Avon Channel to Rodanthe bound by the following points: Beginning at a point near Marker #1 at the Avon Channel Entrance at 35° 22.8212’ N - 75° 33.5984’ W, then running northerly to a point on Gull Island at 35° 28.4495’ N - 75° 31.3247’ W, then running north near Marker “ICC” at 35° 35.9891’N - 75° 31.2419’ W, then running northwesterly to a point at 35° 41.0000’ N - 75° 33.8397’ W, then running easterly to a point on shore at 35° 41.0000’ N - 75° 29.3271’ W, then following the shoreline in a southerly direction to a point on shore near Avon Harbor at 35° 20.9562’ N - 75° 30.8472’ W, then running westerly near Marker #8 at 35° 20.9412’ N -75° 30.9058’ W, then running westerly near Marker #6 on Avon Channel at 35° 20.8224’ N - 75° 31.5708’ W, then running northwesterly to the point of beginning. The area on the mainland side of Pamlico Sound, from the shoreline of Dare, Hyde, Pamlico, and Carteret counties out to 200 yards, between 76° 30.0000’ W and 75° 42.4200’ W longitude lines. All Internal Coastal waters south of latitude 35° 00.0000’N and north of latitude 34° 48.2700’N which runs approximately from the Club House on Core Banks westerly to a point on the shore at Davis near Marker “1”. B. 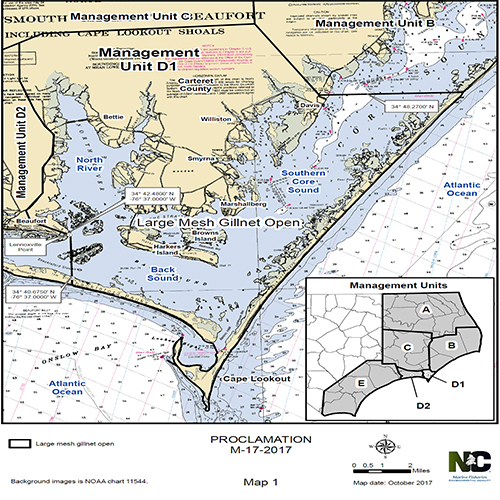 Management Unit C: Pamlico, Pungo, Bay and Neuse river drainages and Internal Coastal Waters of Pamlico Sound west of 76° 30.0000’ W.
Waterway and Harlowe Creek up to NC Hwy 101 Bridge) and Bogue Sound. II. ADDITIONAL AREA RESTRICTIONS - MANAGEMENT UNIT E AND MANAGEMENT SUBUNIT B. 1. 1. Cape Fear River and its tributaries north of the Railroad Bridge described as a line running from a point on the west shore at 34° 15.5760’ N - 77°59.3000’ W;running easterly to a point on the east shore at 34°15.6270’ N - 77° 59.2300’ W.
2. Northeast Cape Fear River and its tributaries north of the Highway 17 Bridge described as a line running from a point on the west shore at 34° 17.9430’ N - 77° 57.5540’ W to a point on the east shore at 34° 18.1320’ N - 77° 57.3790’ W.
B. It is unlawful to use unattended gill nets with a stretched mesh length less than 4 inches through November 30, 2017 in Management Subunit B. 1.: described as an area within the boundary described by a point beginning at 35° 46.3000’ N – 75° 32.1696’ W, the northeastern most boundary point of Management Unit B at Oregon Inlet running westerly to a point 35° 46.3000’ N – 75° 37.4665’ W and running southeasterly to a point 35° 44.1710’ N – 75° 31.0520’ W on the north point of Eagle Nest Bay. 1. Runaround, strike, drop, or trammel gill nets - gill nets that are set and then are immediately retrieved. 2. Drift gill nets - gill nets that are used to capture fish while being moved along by water currents and the net being actively fished and attended from deployment through retrieval. B. It is unlawful to use run-around, strike, drift, drop and trammel gill nets with a stretched mesh length 5 inches and greater. C. It is unlawful to use or possess more than 800 yards of run-around, strike, drop and trammel gill net per commercial fishing operation. D. It is unlawful to use or possess more than 2,000 yards of drift gill net per commercial fishing operation. E. Run-around, strike, drop, drift and trammel gill nets are exempt from the restrictions specified in Sections IV., V. and VI. 1. It is unlawful to use gill nets with a stretched mesh length of 4 inches through 6 ½ inches of more than 15 meshes in height and without a lead core or leaded bottom line. 2. It is unlawful to use cork, floats, or other buoys except those required for identification. 3. It is unlawful to use or possess more than 2,000 yards of gill net with a stretched mesh length of 4 inches through 6 ½ inches per operation. 4. It is unlawful to set a gill net, no more than 100 yards in length, with a stretched mesh length of 4 inches through 6 ½ inches without leaving a space of at least 25 yards between separate lengths of net, regardless of individual net length. 1. It is unlawful to use or possess more than 2,000 yards of gill net with a stretched mesh length of 4 inches through 6 ½ inches per operation. 2. It is unlawful to fail to actively fish gill net sets at least once during a 24- hour period no later than noon each day. 1. It is unlawful to use gill nets with a stretched mesh length of 4 inches through 6 ½ inches of more than 15 meshes in height and without a lead core or leaded bottomline. 3. It is unlawful to use or possess more than 1,000 yards of gill net with a stretched mesh length of 4 inches through 6 ½ inches per operation. 2. It is unlawful to use or possess more than 1,000 yards of gill net with a stretched mesh length of 4 inches through 6 ½ inches per operation. 3. It is unlawful to set a gill net, no more than 100 yards in length, with a stretched mesh length of 4 inches through 6 ½ inches without leaving a space of at least 25 yards between separate lengths of net, regardless of individual net length. Management Unit B (Subunits ONLY), D1, D2, and E as described in Section I. A., C., D., and E.
1. Nets set for Tuesday retrieval may be set no sooner than one hour before sunset on Monday and must be retrieved no later than one hour after sunrise onTuesday. 2. Nets set for Wednesday retrieval may be set no sooner than one hour before sunset on Tuesday and must be retrieved no later than one hour after sunrise onWednesday. 3. Nets set for Thursday retrieval may be set no sooner than one hour before sunset on Wednesday and must be retrieved no later than one hour after sunrise onThursday. 4. Nets set for Friday retrieval may be set no sooner than one hour before sunset on Thursday and must be retrieved no later than one hour after sunrise on Friday. 5. Nets set for Monday retrieval may be set no sooner than one hour before sunset on Sunday and must be retrieved no later than one hour after sunrise on Monday. It is unlawful to fail to report any sea turtle or sturgeon captured in anchored gill nets. Reports shall be made within 24 hours of the capture to the Division of Marine Fisheries at 252-726-7021 or 800-682-2632. Self- reported takes of sea turtles and sturgeon by fishermen fishing without an observer do not count toward the allowable takes in the Incidental Take Permits. A. This proclamation is issued under the authority of N.C.G.S. 113-134; 113-182; 113-170.4; 113-170.5; 113-221.1; 143B-289.52 and N.C. Marine Fisheries Commission Rules 15A NCAC 03H .0103 and 03J .0103. C. The restrictions in this proclamation apply to gill nets used by Recreational Commercial Gear License holders except the allowed yardage in Sections IV. 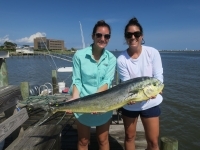 and V. The allowed yardage for Recreational Commercial Gear License holders is described in N.C. Marine Fisheries Commission Rule 15A NCAC 03O .0302.